This usually happens in clusters as well, probably since appservers usually get (re)started at about the same time. @Joe currently thinks that this is not the same bug as T103886. From my (limited) understanding of that bug it doesn't seem the same either: memory usage is a slowly but gradually increasing, it doesn't look like it is correlated with deploy times. This may be the same as T99525 which @ori had been debugging but was downgraded from UBN and eventually closed (possibly erroneously) as a duplicate of T103886. This causes mini-outages every so often, hence prioritizing this to UBN. faidon added projects: acl*sre-team, HHVM. faidon added subscribers: faidon, Joe, ori. I am collecting data on mw1059 (and mw1115 for comparison) to see what changes in the memory profile of both servers over time. In about 1 day of data we should have a very clear picture of what is going on. So it appears that HPHP::StringData::MakeUncounted is what stores most of the unfreed memory, and this only happens on the appservers. As stated by @ori on the preceding ticket, this method seems to be tied to the use of apc, and for some reason the offending use seems to be not present on apis. I'll dig deeper from here. Joe set Security to None. // create either a static or an uncounted string. // of the string. Static are alive for the lifetime of the process. // Uncounted are not ref counted but will be deleted at some point. and the main difference seems to be the use of either low_malloc (for Static strings) or malloc (for Uncounted strings), See https://github.com/wikimedia/operations-debs-hhvm/blob/master/hphp/runtime/base/string-data.cpp#L111. So what seems to happen is that for some reason we don't really understand those strings don't get cleaned up, and they remain to occupy HHVM's memory indefinitely. I just noticed we don't set hhvm.server.apc.expire_on_sets which defaults to false... this is most probably the culprit here. tried an apc-dump on mw1060 (a server that shows significant use of memory) and it created a 5.3 GB file, while on the API appservers the dump is less than 200 MBs even when running since a long time. So APC purging is surely our more pressing problem. Unluckily, it seems that activating the setting (as I did manually on mw1059) doesn't really affect our APC storage, but I guess it's to early to tell. Anyways, we should go on with the proposed change. I was sure this wasn't applied since the APC indefinite growth we show is clear. so eviction of expired keys surely works. What obviously doesn't work is that HHVM has no LRU mechanism for APC entries with no TTL, so we're actively starving its memory resources. I also suspect this way we're making it much more inefficient once enough keys are present there. which are clearly non-evictable (no TTL) or with a very long TTL. without a TTL. Also, we explicitly use APC on HHVM. IMHO, a band-aid solution would be to set a reasonable TTL to the keys, and a long-term one would be to add an APC cache size setting to HHVM and then use LRU evictions there. I have no idea of what "reasonable" would mean in this context. I also created https://github.com/facebook/hhvm/issues/5601 to track what is in my opinion a defect in HHVM anyways. 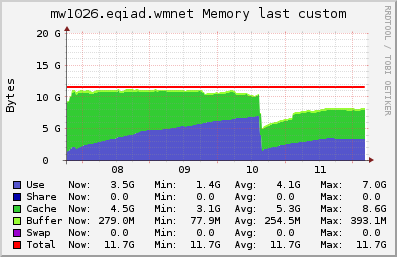 So, @Krinkle's patchset did have an effect in slowing down the growth on the memory occupation, but didn't stop it. Keys that expire get purged at every multiple of hhvm.server.apc.purge_frequency calls to apc_set. I even tried to set a very large number of keys to see if this had any effect, and it didn't. I am a bit in the dark at this point -we're clearly seeing some misbehaviour but I can't track it down to a specific reason, it seems. For the first time, I've seen today expired keys getting expunged. It seems promising but I guess we'll have a definitive answer tomorrow - I expect the memory usage to stabilize around a regimen value. it seems my prediction was confirmed, so the bug is clearly resolved. I would be tempted to set a global upper limit to the ttl of APC keys . thus not resolving the ticket, but i'll declass it to normal priority now.